The ZJK(ICP) series is an extremly low noise signalconditioner, serve to provide sensor excitation power and prepare measurement signals of dynamic ICP® -sensors (acceleration, force, pressure and torque) for readout, recording or analysis purposes for data loggers, recorders and computer based data acquisition systems with on traditional voltage inputs. (ICP is a registered trademark of PCB: piezoelectric sensor with integrated charge amplifier) The conditioner is mainly developed for laboratory and free field measurements claiming very low noise level. As power supply can be used the delivered external 230V AC adapter or - based on the very low power consumption - two 12 V battery. Thanks to its modular structure the desk style instrument can produced as half-sized configuration with 3 or 4 channels, or as full-sized configuration with maximum 8 channels. 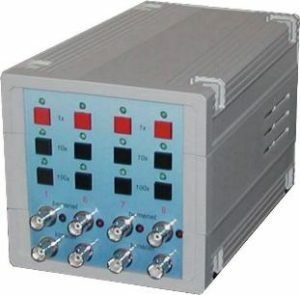 The ZJK(ICP) unit can work with all kinds of ICP® -senors with any sensitivity, supplying constant current power for each connected sensor. The signal amplify gain can switched in 3 steps (standard: 1x, 10x, 100x - other gains can be ordered between 1x and 100x) at each channel. If needed, different gain steps can be ordered for each channel. The sensors signal will be amplified an band-filtered (0,2 Hz ... 10 kHz), the outgoing AC-signal has no any DC-offset. All channels are totaly separated from each other. All rights reserved © 1997-2017 | PIM Ltd.